Thanks for visiting Soderlund Drugstore and Pharmacy History Museum! This is a virtual pharmacy museum. The study of the history of pharmacy is vitally important. Historical out of favor medications may hold the secrets of a medical break-through in the future. Pharmacy history shows the transition from anecdotal treatments to evidence based medicine. It reveals how the past medical practices have changed over time. By looking at our history in the context of the present we are better equipped to decide, "where do we go from here." Dr. Bill Soderlund, Pharm.D., R.Ph. 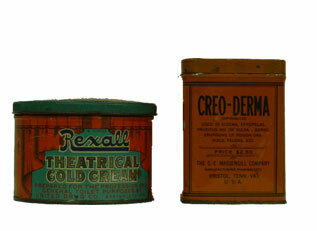 Explore the fascinating world of the early American drugstore on this website. Discover the history of the days before chemistry, before the advent of the scientific method to the birth of the large-scale drug manufacturing companies. This site attempts to explain and show the vital role the pharmacy has played in the American culture. The Pharmacy Museum website contains information about the historic practice of pharmacy of yesteryear. Make sure to check out the Pharmacognosy and "Old Drugs" sections which we are updating all the time. It contains information about historic botanicals and purified drugs. The Soderlund Drugstore Museum contains some of the history of pharmacy, Show Globes, a Soda Fountains and Patent Medicines to name a few. Pharmacy Museum also contains a large collection of historic pharmacy, drug store apothecary and soda fountain memorabilia and artifacts. Thanks for visiting the Soderlund Pharmacy Museum! We hope you will enjoy, learn and ponder! What happened to the corner drugstore? For generations the pharmacy drugstore was the symbol of every small town in America. Unfortunately, locally owned and operated drugstores are becoming a thing of the past. Why is this sad decline of independent pharmacies occurring? Independent pharmacists are finding it very difficult to comply with all of the government regulations. Today small family drugstores often have two full time people doing nothing but filling out forms to comply with all these regulations. This added expense and hassle is expensive and stressful. If a billing error occurs the pharmacy absorbs the loss. Independent pharmacies are facing a declining reimbursement from insurance companies. Large corporate pharmacies are able to negotiate reimbursement rates from the insurance companies while independent pharmacies are left to "take it or leave it". It is illegal in most states for independent pharmacies to collectively bargain. Large national chains can carve out better deals with the insurance companies since they monopolize the region. Additionally, there are few pharmacy graduates interested in owing their own pharmacy. For some reason new graduates are interested in going to work for a large chain pharmacy. When my dad was in Pharmacy College, in the 1950's, most if not all of his classmates intended to own their own store. When I graduated in 1995, only three of my classmates intended to own a pharmacy. Show globes were the symbol for pharmacy for centuries. 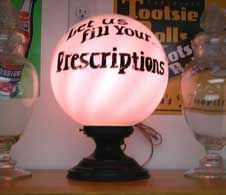 Here is an example of a lighted electric show globe that reads, "Let us fill your prescriptions", and dates to 1916. For more info about this click on "show globes". Some items on display at the Drugstore and Pharmacy Museum include show globes, apothecary bottles, antique pharmacy and medical instruments and an authentic soda fountain from the turn of the last century. The Pharmacy Museum bottles pictured at the right are called "Label Under Glass" or LUG bottles. They would normally be found in any turn of the century pharmacy and contained herbal extracts that pharmacists used in their compounding practice. Drugstore Apothecary cabinet circa 1900. See what's in the pharmacy cabinet. 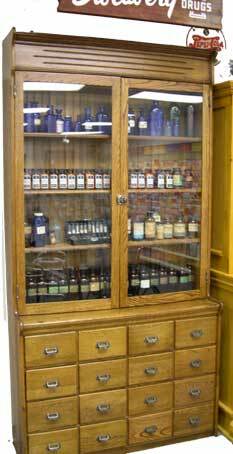 This image is representative of any drug store or pharmacy cabinet that would typically be found along Main Street USA during from the 1900's through the 1930's. These apothecary cabinets were designed to hold tinctures and decoctions in the top part and crude drugs, (herbals), in the drawers below. 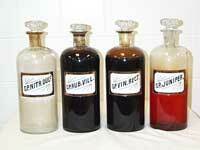 The druggist would use the crude drugs to extract the active ingredients either with water or alcohol. Prior to 1907 there were no safeguards or standards for these crude drugs. With the implementation of the Pure Food Drug and Cosmetic Act of 1907, standards for cleanliness and potency were established. Most druggists were either growing their own herbal crude drugs or they were purchasing them from reputable dealers like the Eli Lilly Company in Indianapolis. For more information about this subject click on the pharmacognosy button. The Pharmacy Museum website contains the history of the American pharmacy as well as interesting historical explanations. 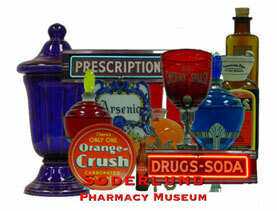 Pharmacy Museum additionally contains many images of pharmacy items that are of historical importance. This pharmacy museum is provided to give a slightly different perspective about the history of the pharmacy than found on most other Pharmacy Museums websites. This pharmacy museum celebrates what is commonly referred to as the American drugstore. This virtual museum is dedicated to my father, Bill Soderlund, Sr., a pharmacist from the old school who spent his life helping people and to my mother, Joan Soderlund, a woman who has always been there with support and encouragement. Thanks again for visiting the Soderlund Pharmacy Museum! We hope you will enjoy, learn and ponder! Dr. Bill Soderlund, Jr., Pharm.D., R.Ph.